The Palm Condos – conjuring images of the exotic, the sultry, and the mysterious – an oasis rising from the torrid heat of the desert to the verdant cool of a tropical island. The Palm, the international symbol of resort living rich in Mediterranean élan. Such is the inspiration behind The Palm Condos; a residential condominium building of unique architectural stature resplendent with purposeful artistry. Here in the heart of Canada’s largest city, The Palm Condominiums will rise – a stunning architectural tribute growing like a magnificent palm tree steps from Finch subway. The building itself incorporates the vision of a palm into its very architecture – through the fusion of magnificent pre-cast, stucco and lightly tinted glass. Enter this fabulous place through a curving fore court, resplendent in rich materials. Here life takes on new beauty, new possibilities – where the fragrant breeze that kisses the gentle fronds of the palm, will bring a breath of fresh air to your life. All suites are protected under Tarion. Coverage consist of: One (1) year work and material warranty; Two (2) YEAR “Power Train” Warranty; Seven (7) year Major Structural Defect Warranty Deposit coverage (set limit). Please note: Prices and specifications are subject to change without notice. 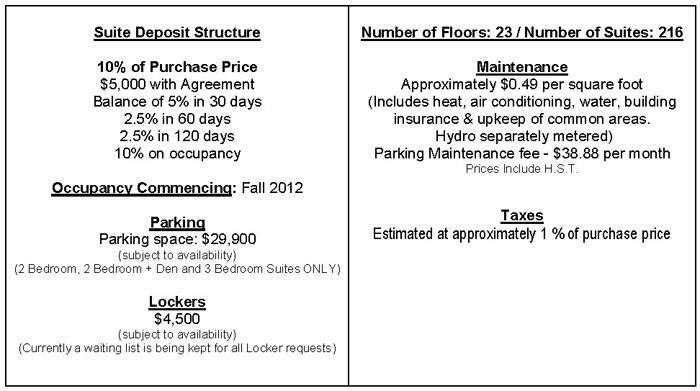 All areas and stated room dimensions are approximate. Floor area measured in accordance with ONWHP bulletin #22. Actual living area will vary from floor area stated. Builder may substitute materials for those provided in the plan and specifications provided such materials are of quality equal to or better than the material provided for in the plans and specifications. Decorative and upgraded items displayed in the sales office are for display purposes only and are not include in the purchase price. Floors and specific finishes will depend on vendor’s décor package as selected. 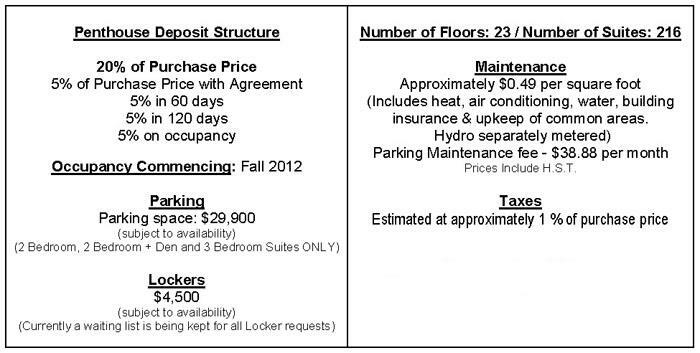 Prices increase approximately $1,000 per floor. Exceptions Apply. Speak to a Sales Representative for details. The Palm Condominiums – a stunning architectural tribute growing like a magnificent palm tree, steps to the Finch subway. An Executive Concierge welcomes you to an elegantly created designer lobby with a grand fountain and lush décor. 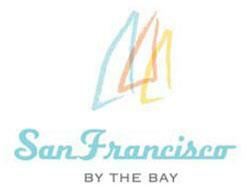 There will be a private outdoor garden terrace and the Palm Club Lounge. The Palm Waters and Fitness Club features a year round Hydra Spa pool that opens onto a sun tanning deck and barbecue area, a steam room, a fully equipped fitness area and his and hers change rooms. The Palm Gathering Centre is a great multi-purpose room for entertaining and includes a full catering kitchen and bar beside the Executive Private Dining Room/Board Room/ Business Centre. All suites feature attractive laminate flooring in the living/ dining rooms and designer loop carpeting in the bedrooms. Kitchens will feature European cabinetry, granite countertop and European tile backsplash. Five appliances include a full size oven, frost free large capacity refrigerator, multi-cycle dishwasher and full size stacked washer and dryer. Lavish bathrooms include distinctive cultured marble vanity countertops with integrated rectangular sink and full height ceramic tile surround on all walls around the tub, and a security system with enter phone facility at building. These exclusive suites feature 9ft smooth finish ceilings, upgraded pre-engineered hardwood in the living/ dining rooms and designer Berber broadloom in the bedrooms. Kitchens will feature European cabinetry, granite countertop and European tile backsplash with under valance lighting. The five Stainless Steel appliances include a full size oven, frost free large capacity refrigerator, multi-cycle dishwasher and full size stacked white washer and dryer. Lavish bathrooms include distinctive cultured marble vanity countertops with integrated rectangular sink and full height ceramic tile surround on all walls around the tub, and a security system with enter phone facility at building.